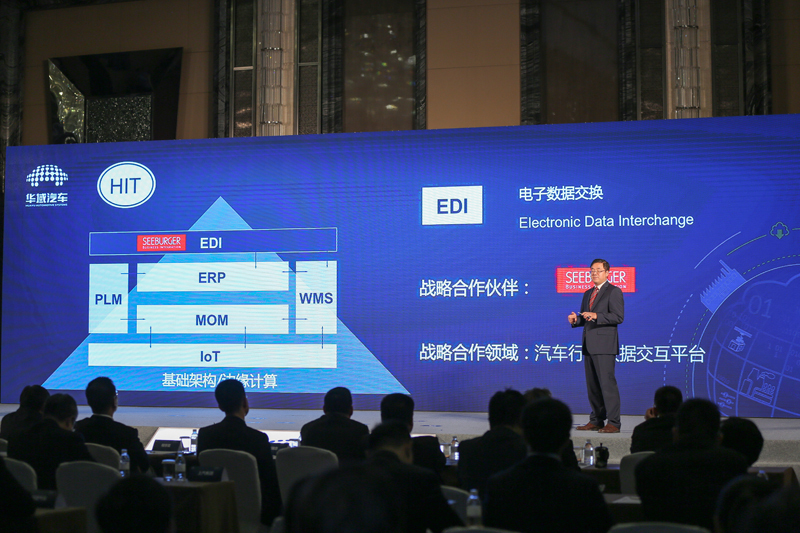 HASCO, the leading automotive components company in China and SEEBURGER, global leading B2B/EDI solution and software provider, cooperate in the EDI and B2B field to build the digital HIT (HASCO Intelligent Transformation) platform. HASCO, a member of SAIC Group, held a signing ceremony of strategic cooperation on May 5, 2017 in Shanghai. Chen Hong, President of SAIC and HASCO; Zhang Haitao, President of HASCO; Cheng Jinglei, Chief Engineer of SAIC along with SEEBURGER AG Vice President Rainer Bartel, SEEBURGER APAC and China General Manager Huang Gang and other representatives from SAIC OEMs and Auto-parts companies participated in this event. HASCO, inheriting from SAIC automotive components business, independently focuses on R&D, production and marketing of automotive components. In 2016, HASCO achieved total sales revenue 124.30 billion RMB, thus becoming the leading automotive components company in China. SEEBURGER, as a global leading B2B/EDI solution and software provider, has been focused on automotive industry for over 30 years, offers seamless internal and external business integration solutions, acts as the integration engine to drive digital transformation and leads the way to industry 4.0 for automotive manufacturers. As the leader in automotive components industry, in aiming to pioneer in industry 4.0, HASCO announced to establish HIT (HASCO Intelligent Transformation), and held a launch ceremony of strategic cooperation with SEEBURGER, SAP, SIEMENS, Huawei and GE, which are committed to promoting intelligent manufacturing works in the future, exploring front-tier practices of enterprise transformation, building an informational, digital and automatic integration platform so as to enhance efficiency, reduce costs and spark innovation throughout the automotive industry. The representative of HASCO emphasized that HASCO will work together with these reputable partners to build the digital HIT platform and expressed that HASCO will have further and deep cooperation with SEEBURGER in the EDI and B2B field. HASCO further explained that they will take a unified infrastructure to support HIT’s operation, and that they plan to spread the HIT platform to 50 factories within 3 years. In 2025, the HIT platform aims to cover 200 systems, connect 500,000 sensors and the annual throughput capability will reach 200TB. Guided by the strategic initiatives of “Internet Plus” and “China Manufacturing 2025”, SEEBURGER and HASCO will work together and make use of each other's advantages to jointly work on establishing HIT, a platform for realizing the digital management and innovation practice of enterprise transformation. Mr. Axel Haas, SEEBURGER AG Co-CEO expressed his congrats via video and said that EDI serves as base for business transformation will be of vital importance for every phase of the HIT project. He is convinced that the SEEBURGER team will apply their best practice for HASCO HIT by offering professional consulting, design and implementation services to realize a comprehensive and seamless business integration as part of HIT. SEEBURGER AG is a leading global provider of standardized industry-specific solutions for the digitalization of internal and external business processes (both from technical and business perspective) – with the most comprehensive solution for SAP users – either as a cloud service, on-premise or as a hybrid integration solution. The technological foundation is the SEEBURGER Business Integration Suite – a central, company-wide data hub for all integration tasks and for secure data transfer. SEEBURGER customers benefit from over 30 years of industry expertise and process know-how from projects at more than 10,000 companies such as Bosch, EMMI, EnBW, E.ON, Hapag-Lloyd, Heidelberger Druckmaschinen, LichtBlick, Lidl, Linde and OSRAM , Ritter Sport, RWE, SCHIESSER, SEW-EURODRIVE, s.Oliver, SupplyOn, Volkswagen and others. Since its founding in 1986, Bretten has been the company's headquarters. SEEBURGER maintains 11 subsidiaries in Europe, Asia and North America. For more information: http://www.seeburger.com.